My Windows 8.1 pro x64 arrived today and I am at the point now where I am just about to installed Roxio Creator NXT2 Pro entered my serial and it stopped installing and came up with a windows saying that the installation was interrupted and could not continue. Looking through the logs it looks as though the cause of the problem is related to DX9C because this is where the installation stops...? I have tried the following without fail. I thought this might have been a permissions issue, but then realised the permissions for the root directory within Windows 8.1 are the same as Windows 8. Tried Windows 8 and the same problem. It worked flawlessly with Windows 8 but on 8.1 it's not working and it looks as though there isn't a fix for this either because I couldn't find anything on Roxio knowledge base or a patch. This is really annoying because I paid for software which worked fine with Windows 8 and not working at all with Windows 8.1 I have tried everything I know how to resolve this matter but if this is incompatible then it's not going to work is it. NEVER run in Compatibility Mode unless the software actually says you should!!!!!!! After that, make sure you do not allow the Setup.exe to start in compatibility mode! Navigate to it, right click and select Properties. Then under Compatibility tab, make sure nothing is checked. Thanks Jim I am out at the moment I shall take a proper look at the error logs and install logs when I get get back. The only reason why I ran compatibility mode was as a last resort as I tried tried everything else apart DX9C which I didn't have time to do before I had to go out. I need yo go through the install logs to try and determine what is causing this. My gut feeling is telling me me that this is DX9C related because it stops at this point. I shall check it out later and let you know the outcome. Thank you Jim for your support. As an IT Technician, they normally say don't follow your gut as it can sometimes be wrong. Well I would disagree with the experts because 98% of the time I am correct. Annoying, at times yeah!... I had a good idea the cause of the problem was DX9 or more commonly called DirectX 9.0 related. I downloaded dirextxsetp and installed DX9.0 and then installed Roxio Creator NXT Pro 2 again and the installer looks to see if DX9.0 has been installed and it skips past and carries on with the installation and installs the software without any issues. The problem with issues like these, is trying to pinpoint who is responsible for not allowing Roxio to download an install DirectX 9.0. As an IT Technician I would hesitate to suggest the cause of the problem is related to RNXT Pro 2 because looking through the install log it looks as though Roxio is trying to download and install DX9.0c but DX9.0 has to be installed first which RCNXT Pro 2 is trying to install hence the reason why the installation fails to install the software.I have only tested this on a clean install of Windows 8.1 and not the upgrade. I don't know if this is happening with Windows 8 to 8.1 upgrade, I would hesitate to guess that it probably is because in principle this is the same but an upgrade instead. If all goes well Roxio Creator NXT Pro 2 should install fine without any errors or issues with the installation. My 8.1 (x64 Pro with WMC) tells me when I try to install DX9.0 that I already have it or a newer version so still no go I have now tried Nero and that works fine I now regret staying with Roxio still I am committed now and won't give in until it works but any suggestion would be appreciated. I do run in the PC native admin mode, A/v off no compatibility set and all defaults no changes. This was a fix for a older version of Creator. Having the same issues with trying to install ROXIO CREATOR NXT PRO 2 on my new Dell XPS 8700 running Windows 8.1 64-bit. The interrruption message seems to appear during the "Rolling Back Virtual Drive x64." In reading the other threads regarding this installation problem I tried the suggestion by Krudomanic to install DX9.0, which I did. 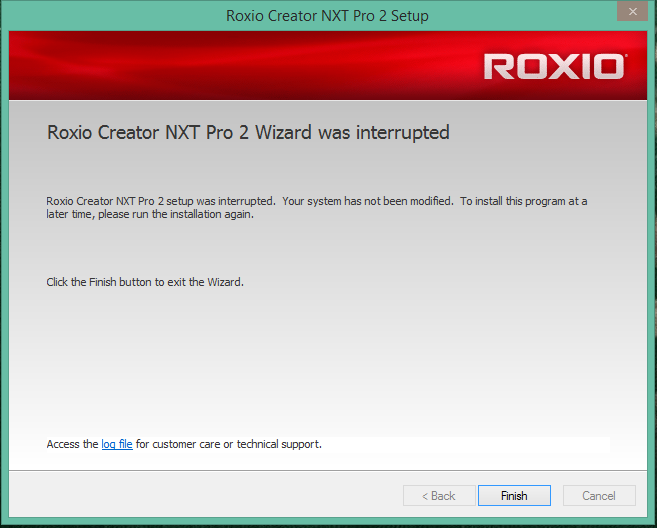 Still no luck with the installation of ROXIO CREATOR NXT PRO 2. Keep getting the same interruption message at the same point during the Roll Back. Very frustrating. Roxio (Corel) of no help. Any suggestions as to how I might attempt to resolve this issue would be much appreciated. May have to request a refund as I am unable to use the program. Thanks. I know this is an older thread but I had the same issue. The issue for me was that the virtual drive was not uninstalled properly from the previous version of NXT. I uninstalled the original driver and resinstalled NXT2 without issue on Win 8.1 64-bit. The other factor that seems to be important was the existence of the Windows temp directory (usually C:\Windows Temp). I had moved mine to a Ram drive but Windows had yet to create any files and therefore it did not exist. Once I created the directory the installer ran fine. Without this directory in existence some roxio programs such as VideoWave crashed on start.